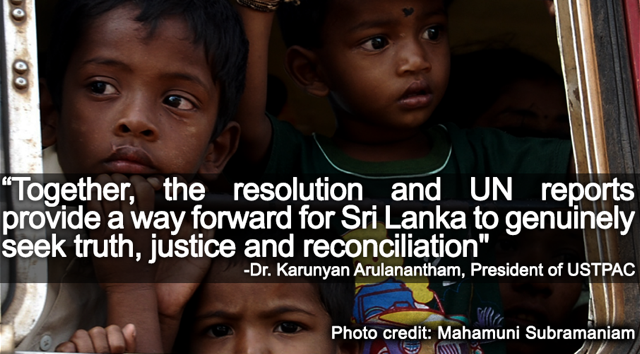 On October 1st, the UN Human Rights Council adopted a resolution on reconciliation, accountability and human rights in Sri Lanka. The resolution is a significant milestone that reflects the findings and comprehensive recommendations of a Human Rights Council mandated investigation and the complementary report and recommendations of the UN High Commissioner for Human Rights. Now it is essential that the recommendations are implemented in full to ensure accountability and justice for the mass atrocities and crimes against humanity committed before, during and after the Sri Lankan civil war. ID advises USTPAC, a US-based Tamil diaspora group that has tirelessly advocated for justice and a political solution to the ethnic conflict in Sri Lanka.